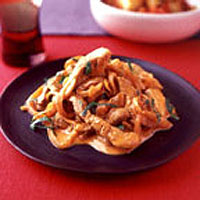 Strips of pork, cooked until meltingly tender, are delicious bound in a creamy sherry sauce. Serve with bread to mop up the juices. Heat the olive oil in a frying pan over a medium heat, add the onion and fry gently until soft but not coloured, then stir in the paprika. Increase the heat then add the pork strips and fry quickly until browned evenly all over. Reduce the heat slightly then pour the sherry into the pan and simmer gently for 5-10 minutes until reduced slightly. Stir in the crème fraiche, season to taste with salt and pepper and heat through. Transfer to a warm serving dish and sprinkle over the chopped parsley, serve hot.